“While charcoal helps to clean the soil of pollutants, it also acts as a soil conditioner. It is used as a top dressing for gardens, bowling greens and lawns. Charcoal also acts as a substitute for lime in soil additives because of the potash content, and it can be a little cheaper than lime. It is used for potting and bedding compounds as a soil and mulch sweetener, and as a fertilizer and insecticide for roses. Some orchids seem to love it. One study showed that adding charcoal to the rooting medium of peas produced a marked increase in the weight of the pea plants and in nitrogen fixation by the plants as compared to controls. It is suggested that the benefits derived from charcoal are due to its adsorption of toxic metabolites that are often released by plant tissues, especially when the tissues are damaged. Charcoal is indispensable in rye grass seed production. Here are some planting tips using charcoal chips. Start with a plastic liner in a tray. Add half an inch to an inch of gravel in the bottom for drainage. Next, sprinkle enough charcoal chips to cover the gravel layer. Charcoal will help keep bacteria at bay. Top this with potting soil and add your plants.” CharcoalRemedies.com p. 191. In a study on the effectiveness of bamboo charcoal as a soil enhancer in the cultivation of tea and spinach, Hoshi Lab., (Tokai University, Japan) found, after three years, the bamboo charcoal tended to retain the supplied fertilizers in the rhizosphere. The bamboo charcoal also tended to keep the soil pH in a range that was suitable for the growth of tea trees. The heights and volumes of the tea trees in the plots in which the charcoal was used were, on average, 20% and 40% greater, respectively, than they were in the negative control. However, no differences were observed in the number of new shoots per tree or in the length of new shoots (stem length of three leaves and the shoot apex). The plot that had the best tea tree growth had been treated with100g crushed bamboo charcoal (particle size approximately 5 millimeters) per square meter per year. “All those dried up stalks, husks and cobs left in corn fields after every fall's harvest could be a key to enhancing the environment, say Iowa State University researchers. They say partially burning some of the residue left in corn fields produces products that can be used to improve soil fertility, boost in-soil storage of greenhouse gases, and reduce the amount of natural gas used to produce anhydrous ammonia fertilizer." Robert C. Brown, Iowa State's Bergles Professor in Thermal Science, is leading a team of researchers studying the idea. This federally funded research is looking into how the corn stover, left after harvest, can be partially burned to create charcoal and a bio-oil about as thick as motor oil. The bio-oil is then reacted with steam to produce hydrogen. That hydrogen replaces the natural gas typically burned to make anhydrous ammonia fertilizer. 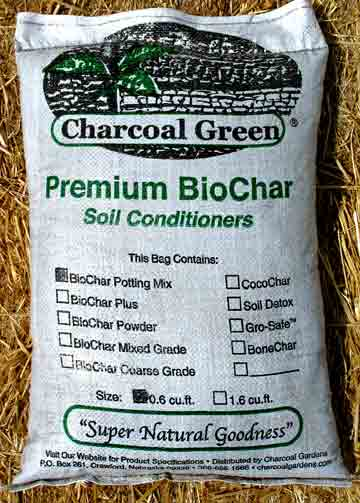 The fertilizer and charcoal are then incorporated into the soil. 1. Farmers producing their own renewable energy to manufacture fertilizer for their fields. 2. Farming that improves soils because the added charcoal supports soil organisms. 3. The charcoal sequestering carbon in the soil, thus reducing the amount of greenhouse gases in the atmosphere. It is estimated a 640-acre farm could retain the equivalent of 1,800 tons of carbon dioxide in the soil. That's the annual emissions created by about 340 cars. Brown uses the phrase reinventing agriculture when he talks about the process. "The conventional goal of good land stewardship is to minimize soil degradation and the amount of carbon released from the soil," he said. "This new approach to agriculture has the goal of actually improving soils." Actually, the practice of improving soil by adding charcoal is not some new revelation. This practice is used in different parts of the world and has even been traced back to the Amazon basin in the days before Christopher Columbus. People there created dark and productive soils (know as " terra preta " or "dark earth" soils) by adding charcoal mixed with manure. Those soils are still more productive today than surrounding soils that weren't treated with charcoal. Complete Handbook of Medicinal Charcoal & Its Applications.